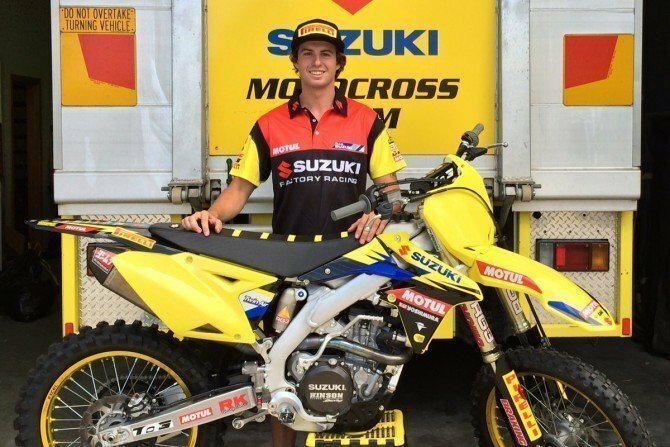 TALENTED Victorian rider Kale Makeham has signed on with Team Suzuki to compete alongside reigning national champion Matt Moss in the 2015 MX Nationals, Australian Motocross Championship, and Australian Supercross Championship season. The 21-year-old will ride a Jay Foreman Racing-prepared RM-Z450 in his transition to the premier MX1 ranks after a number of strong seasons in the MX2 and the Under 19s divisions. “I’m so happy to sign with Team Suzuki and it’s always been a goal of mine to step up to the 450s. It’s a proven championship-winning package and to have Matt Moss as a teammate is a real honour,” Makeham said. The 2013 season saw Makeham race to the runner-up position in the MX2 national championship, before he finished sixth overall this year with a positive end to the season. Earlier in his career, Makeham also captured the 2012 Under 19s supercross title. Team manager Jay Foreman is pleased to welcome Makeham to Team Suzuki with Moss, providing a strong platform for enhanced development in what will be his rookie 450 class campaign. The opening round of the 2015 MX Nationals season is scheduled for Horsham in Victoria on Sunday, 29 March.